When Northwest winds aren't blowing, the energy grid compensates automatically by tapping into hydropower sources operated by the Bonneville Power Administration. But the federal agency says it is pushing the limits of how much backup power it can provide. The BPA is required by the state of Oregon to reserve 1,000 megawatts of hydropower to back up alternative energy sources that have variable power outputs. The agency provides backup hydropower to 3,000 megawatts of wind energy in the Northwest. The backup power is necessary to prevent utility customers from being left in the dark. But with more than two dozen new Oregon or Washington wind farms under construction or in the permitting stage, the BPA may soon be compromising the reliability of its hydropower facilities, said Doug Johnson, a spokesman for the agency. The BPA expects that by 2012 its capacity will fall short of the required reserve amount. "The more wind that comes onto the grid, the harder it becomes to balance those resources with our hydropower," Johnson said. "We're required to provide balancing services when (the wind farms') output isn't consistent. And more developers are asking to have their resources connected each year." One possible solution the BPA is looking into is called customer supplied generation, in which wind developers supply their own backup resources. Wind developer Iberdrola Renewables recently struck an agreement with the BPA to provide its own backup resources for its 1,100 megawatts of Northwest wind power. Iberdrola will use power from a 600 megawatt natural-gas facility it owns near Klamath Falls as well as from out-of-state resources owned by energy company TransAlta and the Grant County Public Utility District. More states may be looking to customer supplied generation in the future, according to Kevin Devlin, vice president of commercial operations for Iberdrola. The BPA's capacity to provide backup resources is smaller than the capacity of state agencies, he said. 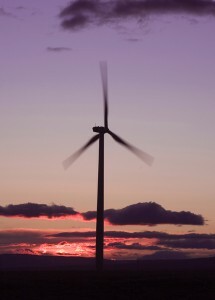 "Other balancing areas are much larger and can absorb more wind more easily," Devlin said. "Over time, this will become an issue everywhere, not just in the Northwest." While customer supplied generation seems like a simple answer to a complex problem, not many alternative energy developers have access to the backup resources that Iberdrola does, Devlin said. Iberdrola is the second largest wind power operator in the U.S.: It has a 24-hour energy trading floor, where it can buy backup power and sell its own power, as well as a national control center for monitoring all of its U.S. wind projects. Until more developers acquire similar resources, customer supplied generation will be limited. "Our company has a long history of procuring transmission as well as access to other electric capacity," Devlin said. "I don't think many other companies are in the same situation." The BPA should be wary of striking too many of these independent arrangements in the first place, according to John Audley, deputy director of the Renewable Northwest Project. He said that too many parties managing the grid in a small geographic area could hurt its reliability. The BPA should continue to explore other ways that it can provide balancing resources without fragmenting operation of the Northwest's power grid, Audley said. "(The deal with Iberdrola) is a great project and we hope it's successful," Audley said. "But having one expansive system like BPA's is still the best way to go. We don't want to lose sight of that." The BPA is working with other utilities and wind project owners to develop better ways to predict winds. Contracting with third-party power suppliers also is being explored, but a pilot project to create criteria for such an arrangement is on hold.